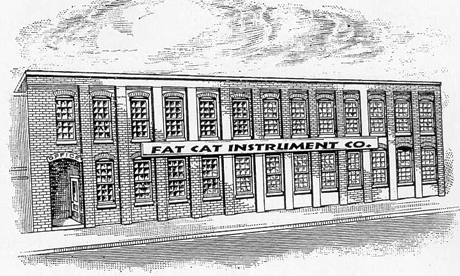 About Fat Cat Oil Co. Inc.
“This is damn slippery stuff!” Famed French horn builder Walter Lawson commented on trying Fat Cat Oil in his shop in Boonsboro, Maryland (Lawson Horns.) Later, I sent him samples of my tuning slide grease and he said it was “the best stuff I ever found for tuning slides.” Of course, being the ever inquisitive Mr. Lawson, he did his best to get the formula from me. But my lips were sealed. Brass players have been putting aside their Al Cass and Blue Juice valve oils to switch over to Fat Cat. Broadway trumpet player Mitch Jellen drops by the shop to pick up a new batch every now and then. Per-Olof Blomqvist sells our First Aid Kits in Sweden. So what is this magenta colored stuff? Fat Cat Valve Oil is ultra-refined petroleum oil that chemical tests have shown to have fewer impurities than other popular valve oils. Fat Cat’s viscosity (“thinness or thickness”) is similar to other “fast” oils but works better because of its purity. So much so that it OSHA considers Fat Cat Oil as non-toxic, non-carcinogenic, non flammable and non hazardous. Although I would not recommend that you put Fat Cat on your spice rack just yet, but you can be assured that Fat Cat Oil will work extremely well in trumpets, baritones, euphoniums, French horns and tubas of all makes and ages. I know because my high school band students have put Fat Cat Oil to the test year after year. Volkwein’s music in Pittsburgh PA put a bottle of Fat Cat Oil in every brass rental instrument they own because their repair staff know that Fat Cat will stand up to the use and abuse of young players. Its precision applicator tip makes it especially easy to reach rotary valve bearings. Still, there are some who doubt Fat Cat Oil’s qualities (am I sounding like a snake oil salesman?). Someone once wrote to me to ask why there are bubbles remaining after you shake the bottle. He had read in some valve oil literature that bubbles equate to foam and reduce lubrication. I told him that you are not lubricating an engine piston at 3,000 rpm; the oil you want just needs to resist wicking away when the moisture of your breath combines with the oil. If you add anti foaming additives, you are in fact, diluting the oil with other chemicals. There is a big difference between the needs of a Bach Strad. and an internal combustion engine. Fat Cat Tuning Slide Grease is quite different in its chemical makeup. It is synthetic grease for a specific reason: Petroleum greases, which are basically anhydrous lanolin or a heavy oil with a lithium soap filler, works well for tuning slides but each tends to melt when warm, or when mixed with valve oil. So as water and the oil from your pistons and rotors seep into the tuning slides, it dissolves an organic grease and later may re-enter your valves, making them dirty and sluggish. Fat Cat Synthetic Tuning Slide Grease is resistant to heat (you can’t melt it on the stove, ask my wife!) and more important, resistant to mixing with petroleum valve oil and water. With this combination of Fat Cat Oil and Fat Cat Grease, you will notice that your maintenance schedule of re-greasing and re-oiling is now greatly extended. When trying Fat Cat Oil for the first time, clean off all old oil with soft cloth. Rotary valve players may give their horns a bath of mild dish detergent (Dawn is great for this) to clean the valves. Coat both the valves and valve casing before reassembling. Rotary valve instruments will lubricate both the inner and outer valve bearings. Next, wipe your tuning slides clean with a soft rag (if the old slide grease won’t wipe off, use a little paint thinner on a cloth). Apply a thin coat of Fat Cat Tuning Slide Grease on the valve slide. If you get excess grease squeezing out of the tuning slide tube, you put on too much. Wipe excess and wash hands after use. When I first experimented with different valve oil formulations, I was a doctoral student in the Columbia University Orchestra (playing horn). I tenuously asked a graduate trumpet player to try my experimental oil. I could tell this was going to be a hard sell. He took the brown medicine dropper bottle between two pinched fingers like picking a moldy strawberry from a pint basket. After taking forever to wipe his first valve and placing not more than a drop on the valve, he sniffed “this oil is unfit.” Brass players can be mighty finicky about their oils. On the other hand, I can open the case of many of my high school band instruments and would not be surprised to find shiny metal filings in the velvet case liner because their valves are bone dry. Between these too extremes, I felt the need for a valve oil that had qualities that would satisfy the most discriminating brass player and also contain the staying power for the player who only oils his valves before the winter and spring concerts. This turned out to be difficult because of the contradictory properties of oil. So you want to be a lubrication engineer? Yes they do exist, although any mom worth their salt would say simply “my son….the engineer.” What these guys will tell you is that everything from motor oil to diesel fuel to solvents to jet fuel is from one source: crude oil. All along the odiferous Route 95 corridor in New Jersey you can see huge refineries with tall silo type tanks. These are the “hydrocrackers” that separate the crude oil into its many components. Gasoline, kerosene and other fuel oils which have a low boiling point are distilled and removed. Other lubricating oils remain and are separated by their respective boiling points. Other refining steps may include removing aromatics and sulfur, nitrogen and oxygen compounds. After this process, the distillates are sent for further filtering, and additives added according to their application. Some lubricating oils may be used as the base for cosmetics, or for printing inks. Somewhere in the distilling mix lies valve oil. Valve oils find themselves in a viscosity range (measured as Saybolt, which is the time it takes to empty 60 mL of oil in a Saybolt viscometer) between a light machine oil (spindle oil) and an inflammable solvent such as lamp oil or kerosene. Some players claim that odorless lamp oil and odorless kerosene does the trick for their valves. This is folly because the corrosive impurities in these fuels far outweigh their lubricating qualities. This is not a wise choice for your soft brass valves. Spindle oils are great for sewing machines and textile mills, but are too thick, and their impurities can be clearly seen in their amber color. Another problem with both classes of oils is they are downright smelly. Bus exhaust comes to mind when I have to play third horn next to a second horn player who uses cheap valve oil. You can easily put any of the valve oils on the market in a continuum from “solvent oils” to “spindle oils,” by their viscosity, smell and how quickly they evaporate.